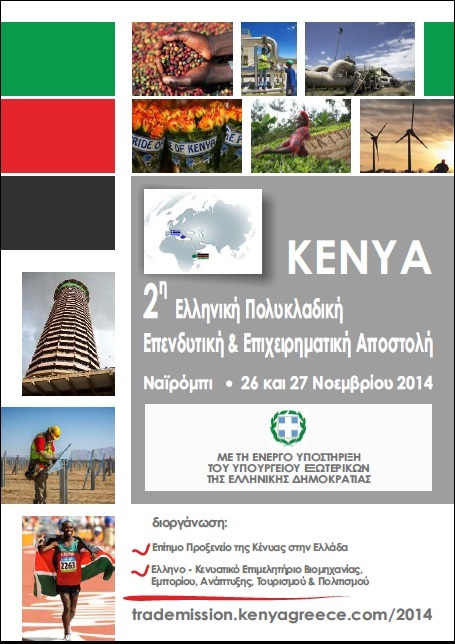 I wish to take this opportunity to welcome you all to the Second Hellenic Multi-Sector Investment and Trade Mission to Kenya, from 1st-2nd October 2014. The forum is a one of a kind, in that, it will provide an opportunity in which business and industry leaders will get a chance to discuss various investment opportunities between the two countries. 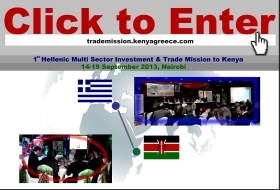 The success of the first Hellenic Multi-Sector Investment and Trade Mission to Kenya in September 2013 is a clear sign of the keen interest by the Greek business community to follow-up on viable business prospects in Kenya. 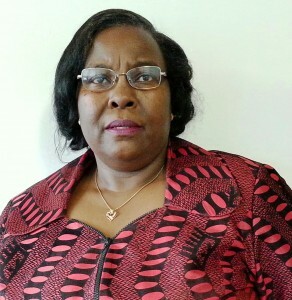 This could be attributed to the positive business climate in Kenya and its increasing economic growth, making it the most industrialised Country in East and Central Africa. It is worthy to note that Kenya has a well articulated development framework, the “ Vision 2030” that aims to transform the Country to an Industrialized nation. Kenya also has an established agricultural industry that is recognized globally for its excellent horticultural produce as well as its famous coffee and tea brands. 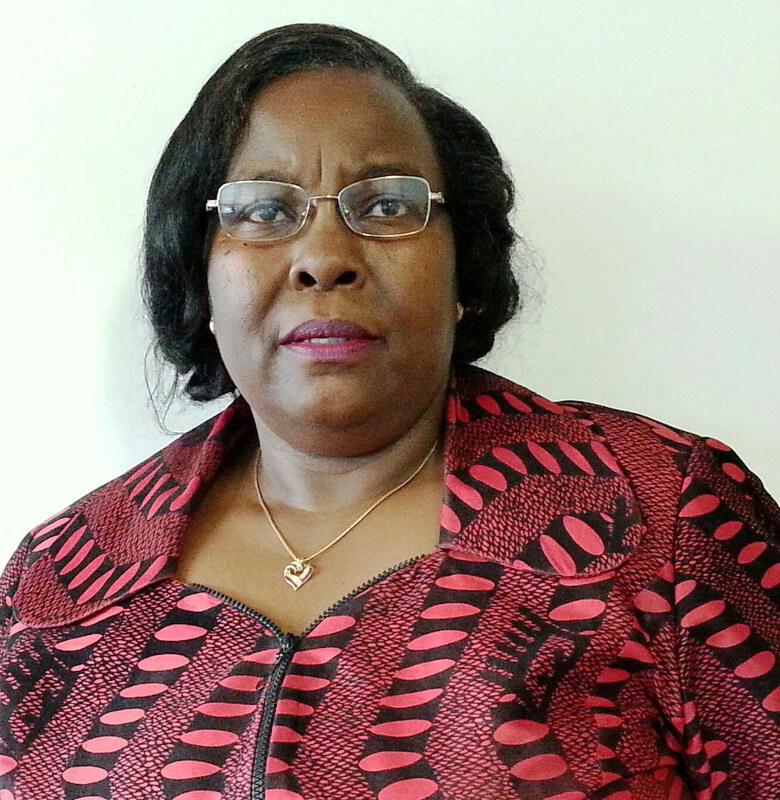 The manufacturing and service sector is also a key driver of its economy due to the high quality of its Human Resource. Kenya’s tourism industry is booming, thanks to her diverse tourism products such as beaches, Safari, Conference and agro-tourism. Many opportunities exist in the Hospitality sector among them Hotels and Resort Cities, constructions, as well as in the Infrastructure development and the housing sector. It is in view of the above that, I urge interested investors and business partners to come and participate in this Trade Mission to Kenya, as it offers a chance to interact with the Kenya’s leading business community who are ready for joint ventures or the public-private partnerships. The forum will also allow the Kenyan business community and their counterparts from the Hellenic Republic to exchange ideas on investment opportunities, and how to strengthen their already established cooperation. I look forward to welcoming all of you to Kenya, and i trust that you will find time to enjoy the Kenyan hospitality during your visit. Thank you and welcome to Kenya.